The firm of Bernadotte & Kylberg has taken the best qualities of the highly acclaimed Hästens 2000T to create a vividly eye-catching interpretation in the Appaloosa. It maintains the classic Hästens checkmark and its history with horses while providing something fresh and new. The team interweaved the original colors to devise a pattern where a quartet of color fields create a graphic abstraction while also giving the Appaloosa the illusion of movement. 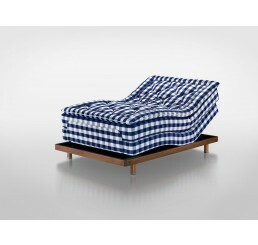 The firm made sure to create a fusion that makes it clear it is none other than a Hästens bed while still giving it a modern, innovative twist. Bernadotte & Kylberg have outdone themselves with their unique interpretation of the Hästens 2000T called the Marwari. 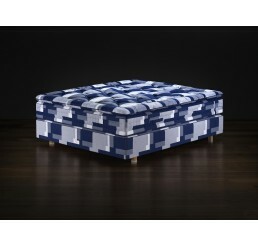 The duo took a close look at the essence of Hästens to redefine the company’s blue and white check and create something that offers a refreshing take while also leaving no doubt whatsoever that it is a Hästens bed. In designing the Marwari, Bernadotte & Kylberg have kept the tradition of using horses in not only the mattress name but also giving it the illusion of saddle girth. Considering the origins of Hästens as superb makers of saddles, the Marwari is a lovingly modern and supremely elegant tribute. 1 Row of Springs (1680 King). All comfort layers are Devonshire wool (locally sourced). Queen set retail $5,760 (with De Luxe). 1 Row of Springs (2212 King). Wool, Cotton, Horsetail, Mohair & Silk for comfort layers. Queen set retail $10,260 (with Prestige). 15% Designer Discount Available. This is our rmest mattress, featuring multiple layers of pristine, staple cotton padding surrounding the Royal Flex® 800i, Swiss designed spring system. Traditional English hand tufting pre-compresses the cotton padding for rm, reliable back support. Optional Pillowtop Pads available to add surface plushness. This mattress is exceptionally rm, yet with a plush surface feel. 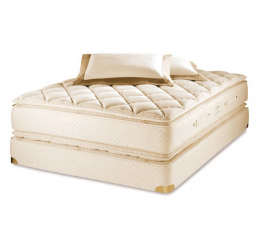 Handcrafted using layers of staple cotton padding that are hand inner-tufted to the Royal Flex® 800i spring system, and topped with Talalay latex, comfort ll, and French wool, to provide surface comfort, while maintaining buoyant support for the body. For a truly luxurious night’s sleep, this mattress offers rm support, and a plush surface feel with its attached Pillowtop Pads. It features our exclusive Royal Flex® 800i innerspring system, wrapped in staple cotton padding, topped with layers of untreated French wool, odorless comfort ll and Talalay latex cushioning in the pillowtop portions. 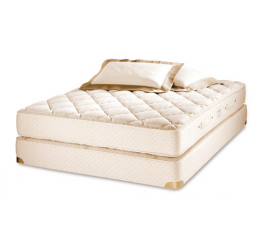 This is our top-of-the-line, most plush pillowtop innerspring mattress. 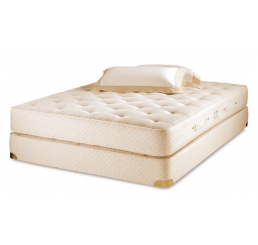 With more Talalay latex cushioning than the Royal-Pedic Pillowtop Mattress, this mattress offers an even more luxurious and “cloud like” feel for extra soothing comfort to shoulders and hips. 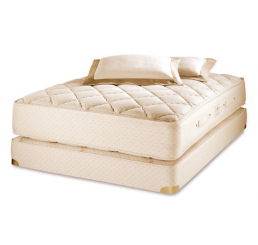 This is our plush latex mattress, featuring the Swiss designed, 7-Zone Talalay latex core. The breathable Belgian cotton covering is quilted with French wool, followed by comfort ll to provide a luxurious feel. It’s a great choice on our box springs, as well as platform beds, and adjustable beds. Optional pillowtop pads available to add even more surface plushness. An ultra-modern bed that adjusts to your life without compromises. Ultra comfortable adjustable bed with a modern aesthetic. Adjust the bed with the included controller or through Bluetooth. All natural materials create a soft, pliable bed where movements go unnoticed. Sliding lateral movement maintains an ongoing distance between the wall and the bed. An adjustable bed with a tinge of modernism. 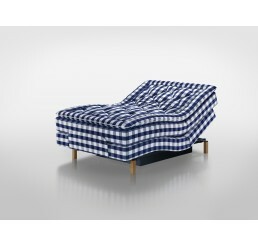 Handcrafted adjustable bed with greater firmness than the Hästens Lenoria. Wireless remote lets you easily adjust the position. 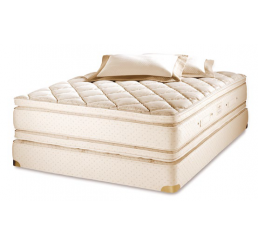 Hästens spring systems ensure proper body alignment during sleep. All-natural breathable layers of material create maximum pliability.